Gilean Douglas was born on Feb. 1, 1900, into a wealthy & socially prominent Toronto family. Her childhood was one of privilege, but when she was orphaned at the age of 16 she began to turn away from her inherited lifestyle and the expectations of the class she was born to. She marred in 1922, and her husband assumed her last name. They set off on an adventurous automobile trip through the States, which Douglas recorded in a journal and photographs. In 1924 Douglas' health collapsed from the effects of an overactive thyroid, a condition that plagued her for much of her life. After seven months in hospital she separated from her first husband and returned to Toronto in 1925. This was her home base for the next 15 years. The rest of the 1920s and the 1930s held two more marriages, much travel, and continuing work as a photo-journalist, with work published under several different pseudonyms. Douglas began to build a reputation as a poet during this time. The year 1939 marked a turning point in Gilean Douglas' life. She moved from the east to the west coast ; from the city to the country. For the next seven years, her home base was a small cabin in an isolated mountain valley. Although she continued to travel and work as a journalist, her life centered around the cabin and the surrounding environment. Much of her later work is built upon the themes of silence and solitude, which form the foundation for her identity as a person and as a writer. The writings recording Douglas' life in the mountains were published under the pseudonym Grant Madison because of disbelief that a woman could have lived the life described. "Grant Madison " developed a devoted following of fans, and Douglas carried on several long correspondences in his name. (She also used this name for some of her feminist articles .) 'River For My Sidewalk' and 'Silence Is My Homeland' document this period of her life. During her years on Cortes, Douglas was active in community affairs. She held local, district, provincial and national office in the Women's Institute, edited a book on its history, and was awarded a Life Membership in 1989. She belonged to the Women's Auxiliary of the Anglican Church and gave the address on the World Day of Prayer for 22 years. Douglas was a member of the first Cortes Advisory Planning Commission and represented Cortes on the Regional Board from 1968 until 1977. She played an important role in framing the regulatory bylaws designed to guide the development brought about by increased population growth. She was also a Weather Observer for Environment Canada for 33 years. Gilean Douglas died on Cortes Island on October 31st, 1993. Douglas' writing career spanned much of the twentieth century. Her first poem was published when she was seven, and as a child she was a regular contributor to the children's page of the Toronto News. In her late teens she worked as a newspaper reporter, as editor of the children's page, and as a publicity writer. She worked as a photo journalist for much of her life and her lifetime venue includes more than 200 publications. As well, some of her poems were set to music and published by Schirmers. From 1961 to 1992 Douglas wrote a regular column, "Nature Rambles", for the Victoria Colonist (later Times-Colonist). The fonds consists of the personal records of Gilean Douglas which were produced and received during her personal and literary activities . It includes manuscripts of poems, articles, short fiction and books ; material generated and collected by Douglas during her involvement with various organizations ; notes and drafts of various writings ; research materials ; an extensive professional, fan and personal correspondence; financial records ; legal records ; lists and inventories ; records of publication ; clippings. There are journals and engagement books dating from 1911, notebooks and address books, and scrapbooks containing clippings of Douglas' published articles and poems . There are also scrapbooks and correspondence generated by her parents dating back to the 1880s. There is a notable gap in records dating from 1929 to 1932. Photographic records date from the 1890s to the I990sand include prints, framed portraits, slides, negatives and film strips. A large assortment of photos documents her family and childhood. Douglas started taking photographs as a child. By her early twenties she was an accomplished photographer, using her own pictures to illustrate her writings. Photographs taken by her during the 1920s through the early 1940s are for the most part found in the albums. Pictures taken in the 1950s and 1960s fall into 3 main categories : black & white photos of the B .C. coast taken during her trips on the boats of the Columbia Coast Mission, color and black & white photos of communities in B .C. and eastern Canada taken during her trips for the W.I ., and pictures of Channel Rock . Unfortunately the slides and pictures taken on WI trips are unlabelled and for the most part can only be identified as to general location and date. During the 1970s and 1980s the photographs are almost exclusively of Channel Rock. A representative sample of these is included in this series ; others may be found at the Cortes Museum and Archives. Aside from Douglas' own photographs, there are several interesting groups of other people's pictures in this collection: an album with pictures of overseas service during World War I, a group of labelled photographs of Baffin Island, Pangirtung, etc. taken in 1926/27 by an RCMP officer, and photographs from a trip around the world on a freighter in 1919. The records offer insight into Douglas' personal history and literary development . They document, in words and pictures, an unusual and interesting life which began at the turn of the twentieth century. Upon Douglas' death in 1993 her papers were gathered together by her literary executor, Gillian Milton. 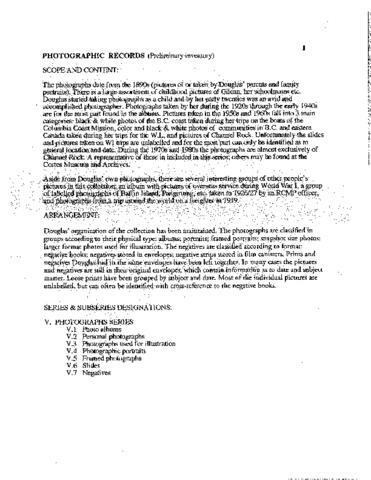 Douglas' will directed that her papers and photographs be turned over to the University of B.C. (Douglas' primary beneficiary), after being examined and used for literary purposes including publication or biography. Accordingly, Milton inventoried the records, and made use of them for a biography and anthology of writings of Douglas, Gilean Douglas : Writing Nature, Finding Home (Lebowitz and Milton, Sono Nis Press, 1999) The textual records were turned over to UBC Archives in December 1999. By agreement with UBC; a small collection of Douglas' records and photographs which have to do primarily with Cortes history was turned over to the Cortes Museum and Archives Society (Mansons Landing, B.C.). which are identified numerically, i .e., A.1 . Box and file numbers are noted on the left hand side of the page on the File List. Photograph inventory available. PDF document attached. All photographic records located in photograph storage.